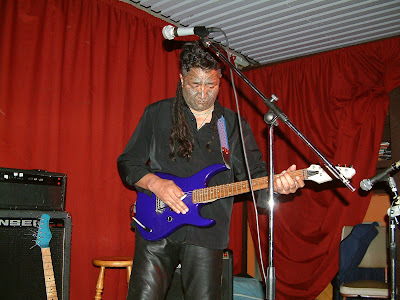 Geoffrey Fuimaono Karena is a Wellington based activist and musician. He is of mixed Maori/Samoan descent and hales from the Bay of Islands. He has been a long time Maori sovereignty activist and protestor. Photo from Teanau Tuino's Conscious Collaboration's website. Mr Karena studied at Victoria University in Wellington from at least the mid '90s to the early '00s. In 2001, the year he stood unsuccessfully for the Wellington mayoralty, he was aged 46 and studying for his Masters in International Relations. He stood unsuccessfully for the '95 and '96 VUWSA presidency. In 2002 Mr Karena served on the executive of Victoria University's Maori student's organisation Ngai Tauira, where he was a colleague of Kaye-Maree Dunn. In 2002/3 he was the president and sole staff member of Te Mana Akonga, the national federation of Maori Student organisations. Around that time Te Mana Akonga was affiliated with Radical Society and NZUSA to the radical leftist Asian Student's Association. In 2003 Mr Karena floated the idea of a National Iwi Independence Party of Aotearoa. Anti EFB Rally in Auckland-Be There!